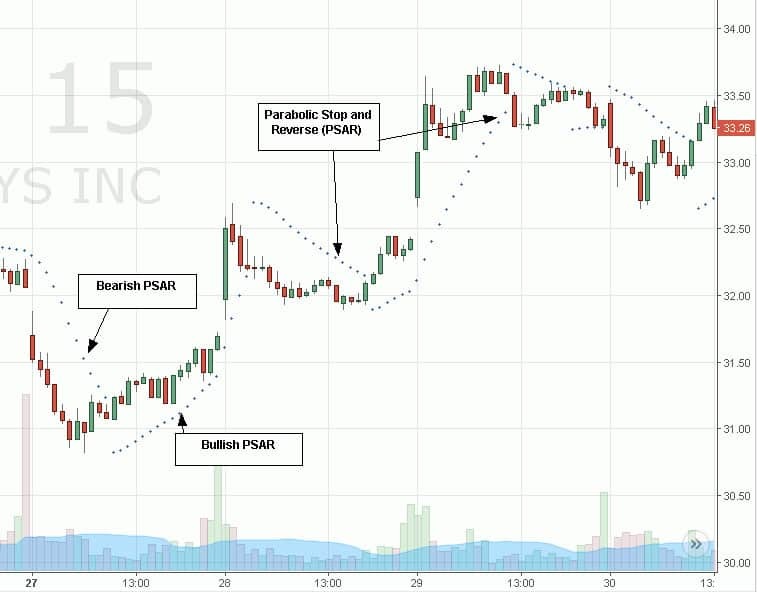 The parabolic stop and reverse (PSAR) indicator was developed by J. Welles Wilder, Jr. as a tool to find price reversals which can be utilized as stop-loss levels as well as trade triggers. The notable difference about the PSAR indicator is the utilization of time decay. The PSAR indicator forms a parabola composed of small dots that are either above or below the trading price. When the parabola is below the stock price, it acts as a support and trail-stop area, while indicating bullish up trending price action. When the stock price falls below a single dot, then a stop-loss/sell /sell-short trigger forms. The parabola will then start to trend down as it trades above the stock price, indicating a resistance level accompanied by bearish price action. Traders can use the upper parabola break as a buy-cover/buy long trigger. The PSAR can be used in conjunction with other indicators like stochastics, candlesticks and moving averages to pinpoint accurate entries and exits.